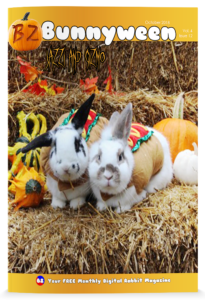 Bringing us our spooky fun season is Jazzi and Gizmo This adorable couple, along with Nastasja give us a really cute interview. For Bunnyween, we have spooky stories, a bunnyween pictorial, and Bunnyween art that you can colour and send into us. and a wonderful rescue story of Flash, the bunny. This 75-page edition of Bunnyzine is available now using the direct download link at the top of the page. Remember to also share this post, we need to grow more if you want us to help bunnies more.